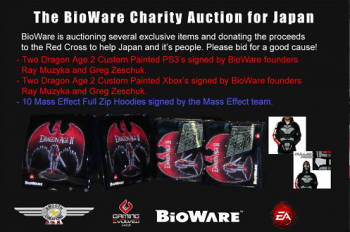 BioWare has put signed hoodies and custom consoles on eBay to raise money for Japan. Japan was hit hard by an earthquake in mid-March, but the country thankfully isn't without supporters trying to raise money to help bring it back to normalcy. Companies such as Sony Online Entertainment, NCSoft, and Valve have done their part, and now it's BioWare's turn. BioWare has put 4 custom game consoles and 10 hoodies on eBay to raise money for the Red Cross to help Japan. The 14 auctions will expire on April 19. The hoodies are the Commander Shepard full zip hoody whose hoods can be zipped to make you feel like the Mass Effect star himself. There are two PlayStation 3s and two Xbox 360s available, each sporting a custom Dragon Age II paint job. All 4 consoles are signed by BioWare founders Greg Zeschuk and Ray Muzyka, while the hoodies are signed by the Mass Effect team. If you'd like to help out, the auctions can be found here.